This weekend our friends from the Yateley churches are organising an event at Wellington Country Park, called Ignite. It's going to run from Friday 1st June to Tuesday 5th June, with a whole programme of events. You can find a load more details about it all here. I mention it first because we're doing quite a bit to support the event. On Friday night Liam Parker, Revolution (our youth band) and the team are running a LIFE event for the youth. Liam is also going to be speaking all through the weekend at a range of youth seminars. Then on Sunday night one of our grown up Kerith worship bands (I'm not sure how else to describe them!) are leading worship, Liam is preaching and Lee Layton-Matthews will be hosting the meeting. Secondly you may well want to go along. It's in a beuatiful location, there is a really good programme, and it's pretty reasonable to go as a day visitor. Again all the details are on their website. Whatever you're doing this extended bank holiday weekend I hope you have a great one, and hopefully I might catch you at Kerith at some point over the weekend for week 4 of the Prodigal God series. Many of you will have heard the tragic news that last weekend a lady was murdered in one of the Bracknell underpasses, very close to both the Kerith Centre and my home. My thoughts and prayers go out for her friends and family who must be devastated by her death, for the individuals and the emergency services dealing with the trauma of what they must have witnessed, and for the police that the killer will soon be brought to justice. It's shocking when something like this happens, but I was also saddened reading the the online version of one of the national newspapers, where the comments section was dominated by people, claiming to be Bracknell residents, saying what a terrible place Bracknell is to live in, and how this is typical of the town. I just wanted to take a moment to counter those (mostly anonymous) commenters, to say that I love living in Bracknell. I've been here for about 16 years now, and I personally think it's a great place to live. I love the quality of the primary and secondary schools and colleges. I love the green open spaces, mostly for me the Elms, Lily Hill Park and the Look Out. I love the huge variety of leisure facilities, with a dry ski slope, ice skating, a cinema, ten pin bowling, a leisure pool, Go Ape and good sports facilities. I love that despite what happened at the weekend it generally feels so safe - I regularly walk through the subways on my way to and from church at all times of the day and night and have never felt threatened. I love the strong community identity we have, with different areas of the town each having their own identity and feel. I love the fact that crime rates overall are falling. I love that it's a great area for both small businesses and multinationals to be located. I could go on and on, but hopefully you get the message! Of course Bracknell isn't perfect by any means. The biggest issue is the town centre redevelopment which seems to be taking forever. Moving it next to the sea and to the North East of England would both be improvements in my opinion. There are also undoubtedly social issues which need addressing, schools which are doing less well than others and all manner of other things which could be better. But overall I love living here, I love the people here, and I want to counter any idea that it's a place in terminal decline or a bad place to be. So there! On Sunday we're due to be baptising about 20 people, which is so exciting. As well as baptisms we've also got our monthly gift day to pay off the interest free loans which helped pay for all the reception improvements. The total needed is now down to £139,500 - on Sunday I'd love to get in enough to get that below £100,000. 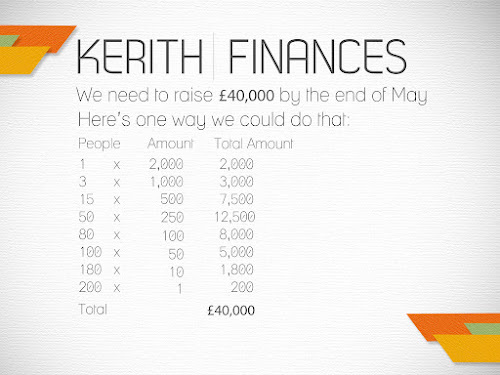 That would mean us raising at least £40,000 (just to be clear although the slide below says we need £40,000, there aren't any interest free loans which are due to be repaid this month, so the need is to help my sanity rather than to stop us having to borrow from the bank!). Please don't be worried by that figure, but please just be asking God what you should give. The table below shows one way we could raise £40,000 - please take a look at it and prayerfully think about which one of those amounts you, or your family, are going to give this Sunday. Together we can do something amazing! After the excitement of last weekend, with Thanksgivings in the morning and The Moment playing in the evening, we've got another action packed weekend coming up with baptisms at all three meetings. 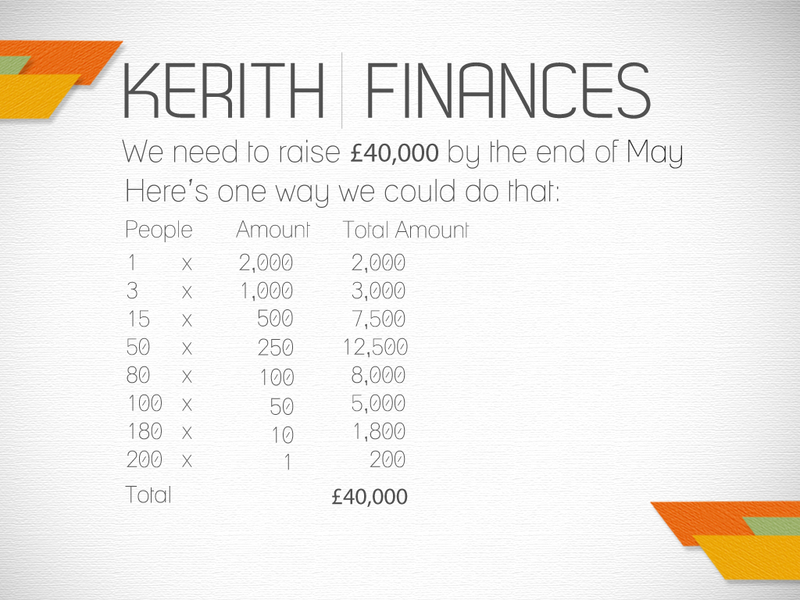 If you were around at the start of this year you'll have heard me say that one of our goals this year was to see 100 people saved and added to Kerith in 2012. Baptism seems about the best way of us measuring that in any sort of meaningful way, so this year one of my prayers is that we'll baptise 100 people throughout the year. We're just about on track to do that which is so exciting. But what excites me more is when I hear the individual stories of lives being changed. That's what for me gets me out of bed in the morning, and keeps me going. On Sunday I got chatting to one of our teenagers who got saved through LIFE. Just to hear how she's come from a totally unchurched background, but now sees her whole future transformed by what God has done in her world was so exciting. So come on Sunday and hear some more incredible stories of lives being changed by the power of God. And if you haven't yet been baptised then sign up for one of our future baptism Sundays - you won't regret it! Last year we had three baptism Sundays. This year we've upped it to six. For 2013 we're considering having baptisms every month, making space for God to do all he wants to do amongst us. Many of you will know that at last years Real Conference (our annual women's conference) I had the dubious privilege of being asked to sing as a surprise for Catrina. I stupidly said yes, not imagining that it was going to end up on YouTube :) And no I'm not going to post a link to it! Well this year the girls have gone a step further and asked me to speak (although this year Catrina knows that it is happening!). I've been pondering for a while what I should say, but then the other night woke up in the middle of the night with a strong sense of the message I should bring. That's not something that often happens to me, normally I can't think about anything beyond the next message I'm supposed to be preaching. The more I think and pray over what I sense God has given me to say, the more sure I am that it is going to speak into the lives of many of the women there. I want to encourage every woman who reads my blog to come to Real, and to think about who else you can bring along with you. Conferences like this are an incredible opportunity to stop, spend time with God and his people and hear his voice in a way which doesn't seem to happen in the normal busyness of life. It's going to be fantastic having Shauna Niequist with us, Catrina will be a brilliant host and speaker and hopefully I'll do OK. Put yourself in the way of God, even if events like this aren't normally your sort of thing. And I want to encourage all you guys out there, both single and married, to make sure the women in your world come. Do something practical for them, forward this blog to them, offer to pay their fees, if they're a mum babysit for their children. You can find all the registration details and much more information here. And if lack of finance is an issue please let us know and we'll do what we can to help. This Sunday we've got thanksgivings for babies and children at both morning meetings. Lee Layton-Matthews is going to be preaching on what it means to be a part of God's family and Catrina and I will be getting up there to thank God for the children. Please come and celebrate with the families. In the evening we've got a free concert with the band, The Moment. Dave Bell, who leads the band, will also be sharing his story of surviving facial cancer and how God has worked in his life. Whether you're a Sunday evening regular or not please plan to come along, and think about who else you can invite to what is going to be a great evening. You have to ask me to include your blog! I don't want to just assume that just because you're part of Kerith you want your blog pointed to from mine. So if you do want to be included leave a comment on this post with a link to your blog and I'll include you. You have to be currently linked with Kerith in some way, either attending on a Sunday, part of a ministry such as Sparklers or Life, or a student whose home church is Kerith. Your blog has to be one that takes me up in my lift! That means being positive about God, about Kerith, about the people within Kerith and about people outside of Kerith. It doesn't mean being unreal, or only writing 'nice' things, but if you're going to write negative stuff you must start with the plank in your own eye rather than the speck in someone else's! I'd encourage you to put a link from your blog to mine. That way your blog is not only an endpoint but can take others onto a journey of finding a whole army of other Kerith bloggers. Hopefully none of that is too onerous. I'll arrange the Kerith bloggers link in the top right hand corner of my blog, and set it up so that the most recent blogs are at the top. That way the more frequently you blog, the more you'll be at the top of the list! As an example of someone in our community writing a great blog which deserves a wider audience I'd encourage you to take a look at Ruth Povey's blog. She's got some great insights on how God works in our lives, and is incredibly real about herself and her journey - definitely a lift up experience. Hope to hear from all of you bloggers out there. Let's keep praying that it is all up and running by January 2013. And thanks again to everyone who has given to make the dream of building the dormitory a reality. If you have any questions then plase ask either myself, or Penny Lander who is overseeing the project from our end. Tomorrow we're going to take a look at the younger brother in the story of the prodigal son in Luke 15. His story is told in three acts, and we're going to take a look at each of them and see what we can learn form them to apply to our own lives. As I've studied the younger brother this week I've just been overwhelmed by how much we see both of our own condition, and how God relates to us, in the story. I just hope and pray I can do it justice, as if I manage to convey even half of what God has shown me about the story it should be an outstanding Sunday. On the evening of Sunday 20th May we're going to have a band, called The Moment, with us. In 2003 Dave was diagnosed with a very rare and aggressive cancer that was attacking the back of his right eye. The outlook was bleak. Dave had to undergo 6 months of intense chemotherapy and 25 sessions of intense radiotherapy. Dave was confronted with the fact that his life may be cut short but through this grasped the truth that God would heal him and bring him through the storm. 6 years on Dave is living life to the full and continuing to share his story of healing. Dave got married to the beautiful Sarah in the summer of 2007. The doctors told Dave that he would never be able to have children because of the treatment that he endured but against all the odds Dave and Sarah have a little boy called Jackson. Dave Bell is an inspiring young man who writes songs out of his very own encounters with God. Dave’s testimony of healing and his personal journey will inspire you as you walk with God. I know Dave through his dad Stuart, who as well as pastoring a great church in Lincoln, and leading a group of churches called Ground Level, also three times a year gathers a group of leaders form the around the UK of which I have the privilege of being a part. Other than our normal welcome and offering the whole of the evening will be given over to the band. As well as leading us in worship and performing some of their songs, Dave will also be sharing some of his story, talking about his faith in Jesus and praying for the sick. Doors will open at 6pm, the band will be on at 7pm, and entrance is free. It should not only be a great evening for us, but a quality event to invite others to as well. Please be thinking now about who you can bring along. One of the many joys over the last few years has been the growing numbers of people in our Kerith deaf community. They're such a great bunch of people, and it's a privilege for us to have them as part of us. One of the difficulties faced by the deaf group is that if they miss a Sunday they can't catch up via the podcast. We've been talking about this for a while, and it seems like the best solution would be to produce a written transcript of each talk which we could then make available for download on our website. We'd love to be able to do this every week, but in particular they have asked if we could do it for the current Prodigal God series as they are getting so much out of it as a group. So here's the ask. Is there anyone out there with both the skills and the time to listen to the podcast, which usually gets posted to the website by the end of Sunday, and within a couple of days produce a transcript of the talk which could be posted back to the website (we can do that last bit if it sounds too daunting). Ideally I'd love to find a team of people to do this so that the task doesn't become too onerous on one person, and we can do it every week. Or alternatively is there someone with voice recognition software who can process the mp3 of the talk and then edit it to produce something intelligible. If you think you could help then please get in contact with Sue Ranger either by emailing info@kerith.co.uk, or phoning her on 01344 862699. Both I, and our deaf community, will be incredibly grateful! I've picked up that a number of people are working through the Prodigal God series in small groups. If that's a Lifegroup then you should already be getting the small group questions to work through in your group, but I thought that other groups might find the questions useful too (if you missed the sermon on Sunday you can catch it here). 1. Read Luke 15:1-32 again. As it's being read, ask yourself "What were the key differences between the 'lost' nature of the sheep, the coin and the son?" How did Simon describe those three different reasons for being lost? 2. How does that change our view and attitudes and behaviours towards lost people? 3. How have you missed God's heart for lost people in the way you've reacted or behaved in the past? Describe some examples. 4. What's the number 1 reason we can say with confidence that God loves lost people and wants them to be found? 5. Who in your life do you most want to see rescued by Jesus? How might you partner with Him in that mission? 6. Thinking very practically, how can our Life Group be more of a place to which lost people are attracted, or one from which we go out on rescue missions? What needs to change? iii) Change us to be more like Jesus - rescue mission partners wherever we are, enjoying his grace, and extending it to others. To all leaders in our community just a reminder that Tuesday night (8th May) we've got a meeting for all of our leaders, starting at 7.45pm in K2. If by any chance you've been missed off the invite list, then please consider yourself invited. I know that a load of you have already bought the Tim Keller Prodigal God book which goes with our current series. We've sold out (again) at the bookshop and are getting in a whole load more copies for Sunday, or you can get hold of the Kindle or iBook version if that works better for you. I'd really encourage everyone to read it as it is a great accompaniment to the series and will help you to get more out of it. It's also quite a short book, and is written in a very readable style, which always helps. 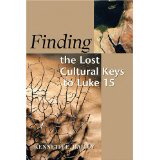 For those of you who want to go into more detail on the three parables in Luke 15, I want to recommend a book called "Finding the Lost Cultural Keys to Luke 15" by Kenneth Bailey. It takes a look at the parables in Luke 15 (the lost sheep, the lost coin and the lost sons) and helps us to understand how they read to somebody from a Middle Eastern background rather than from our Western understanding. I've found it incredibly helpful, both in understanding how differently ideas and concepts are expressed by people from the Middle East, and specifically getting to grips with the relevance and meaning of sheep, shepherds, coins, and the father son relationship as they relate to the parables. We often think of the apostle Paul as being a great theologian, and Jesus being more of an example to us in his life, death and resurrection. One of the things I love about this book is that it presents Jesus as a master theologian and thinker, and helps us to see that we need to understand the writing of Paul in the light of what Jesus said, rather than the other way round. It is quite deep at points, and if you're like me you'll probably have to read some sentences several times to get their full meaning, but it's well worth the effort and I'm getting so much from studying it. Tim Keller also references this book as part of the inspiration for the Prodigal God, so if you've enjoyed the Prodigal God it will give you a deeper understanding of where Keller got his ideas from. Hope to catch you on Sunday for part two of our series. Just a quick reminder to all parents of teenagers in our community, to consider booking them in to the Rocknations youth event in Bradford, which this year is from the 8th-11th August. As a parent of teenagers I can thoroughly endorse both the event, and the impact it will have on your youngsters. You can find all the details including costs, booking forms and who to contact if you have any questions here. As always if cost is a barrier to your teenagers going then please speak to us, as we never want personal finances to get in the way of all that God wants to do. I get many, many requests (more than one a week) both to sponsor people, and to use my blog to advertise sponsored events which which people are taking part in. Most of the time I have to reluctantly say no, partly because I don't want to drive our family to financial ruin and partly because I don't think any of you would appreciate my blog simply being filled with sponsorship requests (if you're one of the people I've said no to in the past, please understand it from my perspective and don't take it personally!). However, every now and again a request comes along which I decide I am going to both support and blog about. This time it's a man called Mark Harmer. Mark is a Bracknell CAP client who is so grateful for the work which CAP has done to help him get out of debt that he has decided to walk from Bracknell to Bradford (where the CAP headquarters are) to raise money for CAP. Along the way he's going to visit various CAP centres who will be providing him with both meals and overnight accommodation. He leaves on Thursday, and hopes to get to Bradford on the 22nd May. If you'd like to sponsor Mark (and please don't feel under any pressure that you have to) you can find his sponsorship page, and read a bit more about what he's doing, here. I loved what Mark said to me recently when I saw him on the Alpha course. His comment to me was that although he hasn't yet found faith through CAP, he's found hope. My prayer is not only that he gets to Bradford with no major mishaps, but also that in it all his hope turns into faith (hope you don't mind me saying that Mark! ).